Rebecca Lee Peery was born in Holy City, California. She moved to the Bitterroot Valley of Montana and then settled in Utah. Since the time she was a child she dreamed of being an artist and by seventeen she began painting in oil. She studied art at Utah Technical College and UVU. She’s taken workshops from renowned artists and has learned a great deal from painting with Linda Curley Christensen on several LDS Temple Murals. 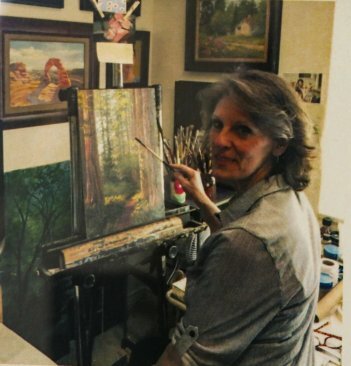 She has enjoyed teaching oil painting classes in the public school system as well as private instruction in her home studio. She currently enjoys teaching painting at the Payson Senior Citizen Center. Rebecca gets a lot of her inspiration for much of her art from traveling throughout the world. These experiences are reflected beautifully in some of her paintings. Her original art has been displayed in public venues and exhibitions. Private collectors have purchased her art. Several paintings hang in permanent collections including, government buildings in Utah County and Draper. She has won numerous awards for her work in various juried shows. Over the past several decades, Rebecca has served in various positions with Intermountain Society of Artists, Provo Art Board, and Utah Valley Artist Guild. She served two years as President of UVAG. Rebecca currently serves as President of Peteetneet Art Council in Payson. Rebecca and her husband, Hal, live in Payson, Utah. Between the two of them they have ten children and numerous grandchildren.